Cons: Wall mounting bolt heads are too big for the bracket pockets. I received this thing in about 2 days which surprised me. Thanks NCIX!Install instructions are clear and easy to follow but why for the love of God have it fastened to the wall by 3/8ths by 2.5 inch lag bolts?!? I went for the wood install and I can tell you your socket won't fit in the opening for the bolt after you've got the bolt head in the pocket!!!! You have to see it to know what I mean... Do yourself a favour and either get smaller bolts or get some washers so the head of the bolt won't go completely into its pocket. If you do that though you probably won't get the plastic covers on. If your going to replace the lag bolts look for ones with a 7/16th inch head and no longer than 2 inches. Jeeeeez! This thing isn't going to hold up 500 pounds!Other than that it's a piece of cake to install if you're mechanically inclined. You can tell the unit is really well engineered and well built. A nice touch is that you don't have to use the second arm. In our install the second arm just wouldn't work because of how I had to mount it. So I pitched the second arm and it's connected via the one VESA arm. Works perfectly and is really adjustable.Highly recommended and for an easier 2x4 wood install try and get lag bolts with smaller bolt heads. 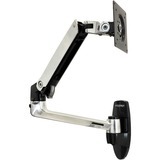 I have three of these arms now plus one desk mounted version. The first two I bought over a year ago and have 24 inch monitors being supported. The position is easy to set and hold in place without having to constantly readjust. Included are a set of thumb screws that makes attaching the monitor much easier, no need for a screwdriver. Pros: This unit has great flexibility with ease of use and easy to install by yourself. After receiving the boxes from NCIX I opened them up to find that thay were packed to travel, The shipping company was brutal with the boxes and i expected some damage but none was evident after complete unpacking.I found the whole system was built very strong and the finish on the parts was incredible.All the arms were polished aluminum and with the built in cable management system hiding the wires was easy. install of the two units was easy ( used to set up my eyefinity system) just bolt the wall adaptor to the wall and then assemble the parts on the mount! and then you can mount up to a 22" monitor that easy!! now i can rotate the two side panel's in portrait for picture editing or leave them in standard to game with.I looked at a lot of systems and this one from Ergotron is the best!!! Thay also have a triple monitor setup that will hold all three screens but that is not what i needed for my custom setup. Five stars is what i give this product well done Ergotron.P.S.you can see my custom rig by googling "ebcogs" this is my sit in race simulator. Specifications LCD Size: = 24"